Creating blog post content can be incredibly difficult. Today, I am going to show you how to continuously brainstorm blog post ideas so that you can create a blog that people turn to time and time again. Are you ready to produce your blog's best content? Get prepared to brainstorm and reflect on past content so you can continuously fuel your blog without wracking your brain every day. Brain dumping sessions can be extremely vital to a happy and healthy brain. To do an adequate brain dumping session take out a pen and a piece of paper, find a quiet space, and write until you are empty. 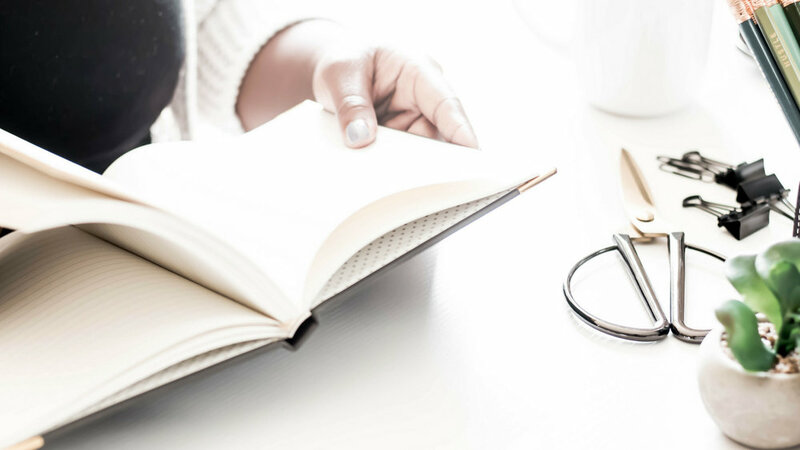 It is possible to brain dump about a specific topic, but you may want to brain dump about everything because you will have a much clearer brain after you do so. Part of brain dumping is tied to the need to brainstorm ideas, but it also just clears your head of anything that will get in the way of the flow of creativity. Creative blockages are a no-no. How Often Do I Brain Dump? You can brain dump as often as you think you need to do so. There is no set time to brain dump as it just depends on how your brain feels. When you sit down to get work done, does your mind feel clogged? It may be time to open it up a bit using brain dumping! Do you have a general idea in mind, but you aren’t sure where to start when it comes to potentially tackling a subject? AnswerThePublic allows you to see the most searched results when it comes to a particular topic and it gives you a variety of exciting ways to tackle a subject. For example, if you wanted to write a post about Pinterest, but you had no idea where to start when it came to thinking about what part of Pinterest you want to cover, AnswerThePublic gives you various visual representations of the most searched things when it comes to Pinterest. You can sift through these Pinterest topics, click on the topic to read top ranking articles on Google about the subject and see where you can add valuable information. How can your words stand out from the crowd and make a difference on Google Search results? You want to answer the questions you want to rank for naturally, but providing a dry version of what is already trending on Google may not make you rank on a subject that is already heavily discussed. What makes your content different? How often should you use AnswerThePublic? You should use AnswerThePublic when it makes the most sense for you and what you struggle with. If you have a broad idea of the type of content you want to create on your blog but you aren’t sure how to turn it into a valuable post that people are craving the answer to, then use the site. AnswerThePublic works well if you talk about the same topic a lot on your blog or you are writing a blog post series, and you aren’t sure what to cover. Mind mapping sessions can be EXTREMELY beneficial for you as you are thinking about the types of posts you want to create for your blog. If you are an extremely visual person and you want to be able to see things more clearly this hands-on way of outlining and brainstorming can be fantastic. My favorite mind-mapping app Lighten, which is .99 cents on the Apple App Store, is an excellent way to mind map on the go. It’s cheap, and it’s simple to use, but it helps you create complex mind maps. You can also quickly create mind maps on paper if you would rather steer away from using technology. When does a Mind Map make sense? A mind map makes sense when you are trying to brainstorm ideas for a series or you are creating a list post and need all of your content to revolve around a central idea. Mind maps are perfect for the brain that wanders into different directions and works exceptionally well when you use apps like Lighten which make it easy to erase, reconnect, and think about your ideas in a different way. One, you can see what is performing well in the search section on Pinterest. What is Pinterest highlighting as trending? What is Pinterest sharing across the board with users? Any unique things trending in their general categories like DIY, women’s style, etc.? Evaluate what makes those pins so special. Second, if you are interested in writing about a specific topic, see what has the most repins for that topic. Is there anything special about that pin or anything special about that pinner? What are people pinning when it comes to this topic? Third, check out your stash of pins to see what is doing exceptionally well. If the post is an older post, see how you can piggyback off of that post to make a newer, updated version. But, why do you even care about Pinterest? The power of Pinterest cannot be mistaken. Pinterest is one of the only websites out there that makes it easy to get in front of your ideal audience with a little bit of practice and research. Understanding what is making Pinterest tick at the moment can be the key to a ton of increased traffic. We all have that one post. The one we poured our heart and soul into that didn’t end up the way we wanted it to. Instead of moping around at the missed opportunity–figure out a way to remake the post using all of the information you learned the first time you wrote it. How can you deliver it a smidge differently? Use different words and update the post with the knowledge you have gained about the topic since you wrote the first blog post. So, why are we revisiting past content? Simple, because the past has a lot to teach us, and we don’t have to be done with our content yet if we have more to say. Revisiting a post that we have made in the past, that didn’t do as well as we'd hoped, can help us make more content. If your blog is a niche blog, you have to revisit your material. There is only so much you can say about blogging, college, human resources, or any other topic you write about on your blog. Going back to see what you could have done better will help you grow. Are you an avid live streamer? Sometimes we talk about so much random content on our live streams, or we get questions from the audience that would make an excellent blog post. Reviewing your old live streams is a great way to repurpose old content in a new form. Some people pay a person to transcribe their live stream then clean it up a bit to make it a blog post. You may or may not want to have something that simple as your new blog post, but it can be a great way to start thinking about how to turn past live streams into blog content. Why should you look at old live streams? You can utilize live streams for many purposes, not just to dive into video this year. By using live streams, you can do a couple of things. Write a post using content you have already basically put into the universe. Give your readers who learn by reading something to read. Give your readers who learn by seeing something to see if you embed your live stream on your blog. There is also a bit of cross-promotion happening as well. You can edit the page where the live stream is housed and say, "Check out the post," and if you embed your live stream in your blog post that gets you more views on your live stream. Talk about win-win! Quora is an excellent site for many reasons. You can use it to become more of an expert in your field by answering questions on the site to the best of your ability. I think that Quora is just an awesome way to get your advice into the world and be a great leader in your community. Quora is terrific over sites like AnswerThePublic because there is the added social component of Quora because it is set up like a forum and you can interact with the people who are asking the questions on some level. When you can get people interacting in your comments section it is a great feeling, but have you ever thought about how you could use those comments to create brand new content? Often people ask questions about your work in the comments section, so sift through the comments on some of your past blog posts and see what questions you may have in the comments section. You may have even already commented on the issue, but imagine how much more detail you can provide with a dedicated blog post? Make it a habit in the future of creating a Word or Google Drive document dedicated to the questions you get as you respond to blog comments. Once you create this document, you can create even better content that your readers obviously have questions about. So, why should you care about blog comments? Simple, these are readers of your blog telling you exactly the things they have questions about. Using sites like AnswerThePublic and Quora are great, but there is something inherently greater about figuring out the questions that YOUR audience has and then answering those questions. Ah, holiday traffic. It is essential to start planning for that traffic early and thinking of ways that you can post it early so that it has time to linger a bit. When your content has time to breathe, it becomes easier for search engines to pick it up. Obviously, you don’t want to start planning for Christmas traffic in March, but it is a good idea to figure out which holidays are important and find ways to include that holiday content a bit early. If you think about holiday traffic the month of the holiday it won’t be good for SEO, plus, starting it a bit early will help you figure out what to write. Why is holiday traffic so cool? If you can find a way to incorporate holiday posts into your blog in a strategic and useful way this can be beneficial for you. Holiday traffic is great because they are coming to your blog for a specific purpose, to figure out things to do for that holiday. Whether it’s the best presents to shop, places to stay, or how to stay productive during that season. People want answers, and you can provide those answers, and of course, add in a few affiliate links or products while you are sharing your expertise. Be sure that you consider other "holidays," that aren't celebrated as national or state holidays. Holidays like back to school season, Chocolate Cake Day, Pi Day, National Puppy Day, etc. can all be just as effective in your marketing strategy. Check out this list of fun holidays you may want to incorporate into your marketing strategy. Q&A Posts are extremely helpful to your audience. Your audience likely has tons of questions for you (and even questions about things you haven’t covered on your blog yet.) Creating a place for them to submit their questions can be valuable. Do an open call on social media, create a survey, and work to collect those questions. Once you have received a good amount of questions, you can decide to dedicate an entire blog post to a question or do a roundup of various questions based on the amount of detail you want to have in your blog post. Why should you create a Q&A post? Well, it’s simple, it makes your blog even more interactive. If your readers can share in your blog creating process and give their opinions on what you discuss, it makes them feel important. This type of post serves two great purposes: getting content for you and making your readers feel significant. Many bloggers create blog post idea content on their blogs. Blog post idea lists are a great way to gain some inspiration for your blog and brainstorm blog post ideas. You may not use their exact content, but checking out their posts may give you some inspiration to brainstorm your content. When you are going through these lists, note any topics that seem interesting to you. How can you take those ideas a step further? How can you make it more specific for what your audience has questions about? Why should you consider using prewritten blog post ideas? You should consider these blog post ideas thought starters. Fifteen Effective Human Resources Blog Post Topics by Amanda Cross Co. 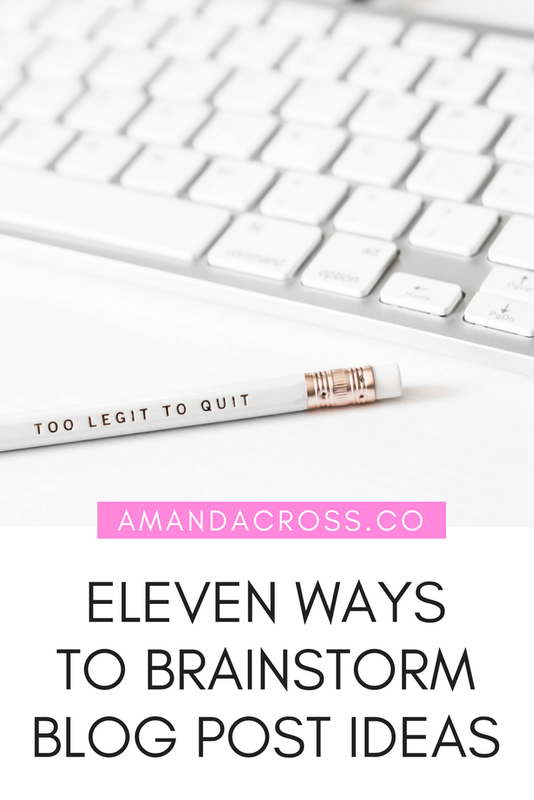 There you have it, eleven ways to brainstorm blog post ideas! I hope that this information has proved helpful for you no matter if you are a blogger or a business who wants to create more blog content. Brainstorming is an integral part of the creative process of blogging. Coming up with fresh new content ideas every month will help you create a blog that people love and come back to often. How will you use this week's content to brainstorm blog post ideas?